The villa lies directly above the village of Positano in a lovely position with a superb view, and from the garden and from the terraces you can take in the whole coast as far as the promontory at Praiano, and below you can see the centre of Positano and the beach. The special atmosphere and particular warmth of this property mean that few people really want to leave it to go down to the beach, even though it`s only 15 minutes away on foot. 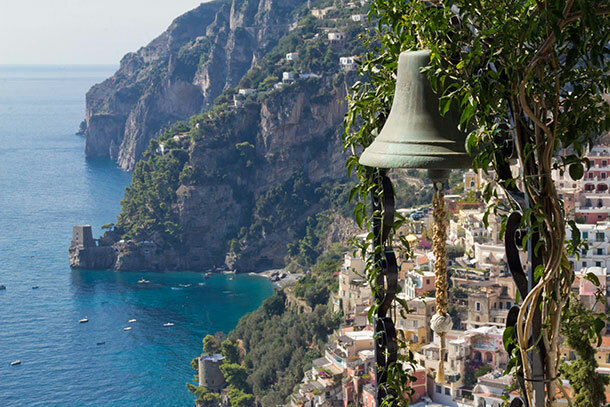 There`s nothing new to say about Positano, and it goes without saying that it is one of the most fascinating places in the world, where both during the day and at night-time you can go through wonderful experiences that you are unlikely to find elsewhere. You reach the villa on foot up an attractive little alley-way of about 200 metres, and our guests can use a baggage-carrying service both on arrival and on departure. From the entrance gate, passing through the garden, you come to the main part of the house, and carrying on along the garden terrace you come to the second part of the house, which is completely independent. On the terrace below there is a private swimming-pool (10x10m) for guests` use, that has been furnished and equipped with great care. Every angle of the fenced garden is like a perfect water-colour of a beautiful view. Villa Omero is furnished in modern style with some rustic details, is it comes equipped with satellite TV with video recorder, stereo with CD player, telephone, internet connection, air-conditioning, dishwasher, washing-machine, barbecue, small wine-cellar with assortment of wines. Two domestics look after the cleaning of the house during the week and are available for anything you might need. Outdoor jacuzzi hot tub. Distances: Sorrento 16 kms, Amalfi 13 kms, Ravello 20 kms. (Villa) GROUND FLOOR: The main floor has a well-equipped kitchen and spacious living room with sofas, TV, fireplace, video recorder, CD player, stereo, computer with DSL internet connection and access to the terrace; 1 double bedroom with bathroom and shower, and balcony. DOWNSTAIRS FLOOR: 4 double bedrooms with bathroom and shower, and access to balcony. In two of the 4 double bedrooms it is possible to separate the beds. Two of the bedrooms can only be accessed from the garden. ANNEX: 1 double bedroom with bathroom and shower, and access to the garden. Other services included in the price: Cleaning during the week 8 hours, 6 times per week for a total of 48 hours per week. Breakfast, luggage carrying service available from 8:00 to 18:30, initial food stock in the kitchen on arrival.